March 28, 2013. I remember six years ago, my mom and I went on a Visita Iglesia where the Blessed Sacrament is exposed in many churches for worship and veneration and recite the Stations of the Cross-that is two stations per church until we reach the seventh one among the rest of the faithful- which we actually do during the Holy Week instead of going out of town. This is the first time my youngest sister was unable to come with us because of a pounding headache that made her indisposed so our mom decided to let her stay home as we will be praying for her. After attending the high mass of our Lord’s last supper on Maundy Thursday, we went home to have dinner then our driver readies our car and off we go to start our visita Iglesia. Our first stop was at our very own church- the Cathedral Shrine of the Good Shepherd- which is a stone’s throw away from our house. It was already full of people praying the rosary while others are doing their Stations of the Cross. We prayed before the Blessed Sacrament and started our first two stations in prayerful meditation afterwards. (1) Jesus is condemned to death, and (2) Jesus is made to bear His cross. In the first station, we see that justice is crushed by weakness, cowardice and fear of the ruling mindset of the mob. The quiet voice of conscience is drowned out by the cries of the crowd. Evil shows its power from wrong decisions and concern for what other people think. The Lord was condemned to death because we fear of what other people may think and kill the small voice of our conscience. So too, throughout history and even today, the innocent have always been maltreated, condemned and killed. How many times have we ourselves preferred success to the truth, our reputation to justice? Let us pray to the Lord to strengthen the quiet voice of our conscience, in our lives. Let Him look at us as He looked at Peter after his denial. In looking at the image of our condemned Savior, His gaze looks right into our hearts and indicates where the course of our lives will take us. On Good Friday, the mob clamored for His death, and He brought them to conversion. In this way He all us gave hope. We pray anew to Him to grant us, the grace of conversion. In the second station, it came to mind what the Lord Jesus hath said: Take up your cross and follow Me. Every day of our lives we carry our own crosses-problems, trials and sufferings in many forms. It’s too heavy and it becomes unbearable to the point that it crushes us and we break down. Indeed to follow Him is very costly because the price of justice in this world is through suffering! Jesus, our true King, does not reign through violence or vengeance, but through a love which suffers for us and with us. He takes up the Cross, our own cross, the burden of being human, and the entire world. And so He goes before us and points out to us the way which leads to true and everlasting life. “I am the Way,” He said. He willingly subjected Himself to mockery and scorn. Let us pray to Him to help us not to be counted among those who look down on the weak and suffering, to acknowledge His face in the lowly and the outcast. We pray for the grace to never lose heart when faced with the hatred and contempt of this world, which mocks our obedience to His will. He carried His own Cross and He ask us to follow you on this path (Mt 10:38). We pray to Him to help us to take up the Cross, and not to turn away from it. May we never complain or become discouraged by life’s trials. May He help us to follow the path of love and, in surrendering to its exigencies, to discover and appreciate true joy. 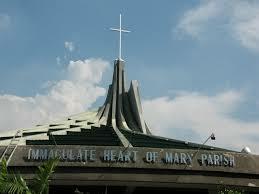 Immaculate Heart of Mary Parish in UP Village run by the Claretian Missionaries. Next stop for us was at the Immaculate Heart of Mary Parish in UP Village. The moment I saw the exposed Blessed Sacrament, a slogan under it had caught my eye “Witnessing to the Richness of Faith” Indeed our faith is so rich but it should keep us alive and going despite the many trials we go through. If we put our faith in proper use, then the Lord can work in and through us so people will see it and glorify Him. And then we start out with the next two stations: (3) Jesus falls for the first time, (4) Jesus meets His mother. After reciting the fourth station, I told my mom that we should go and light candles before our Lady’s image outside and we did. It was our first time to visit the IHMP and it was special because I felt how the Lord longs to see our Blessed Mother to alleviate His sufferings during His Passion. It is truly important to have our loved ones with us in our times of trials to strengthen our resolve to endure and then get up again after a hard fall. We earnestly prayed to our Lady for the grace to love our Lord Jesus and have compassion on others. 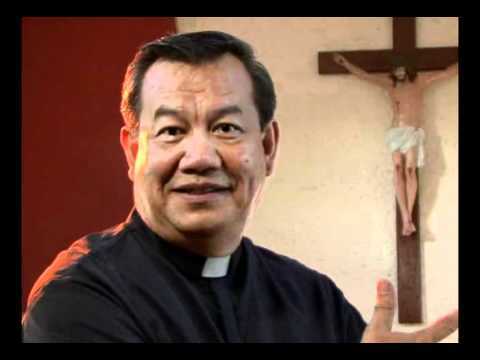 Then we went to the UP Parish of the Holy Sacrifice in Diliman where I have fond memories of attending noon time masses and going to confession as well as visits to the Blessed Sacrament during my vacant periods before attending the next class all throughout my campus life. I still visit even long after I have graduated from my college alma mater. But this time around, is for the visita Iglesia. It was enthroned in a beautiful garden where everyone was in deep prayer. Afterwards we reflected on the next two (5) Simon of Cyrene is made to bear the cross, (6) Veronica wipes Jesus’ face. Even when we face trials, we also help others get through their own. We don’t carry their burdens literally but we pray with them for God to lift their burdens. Let us not be indifferent to others in need. The face of our Lord Jesus Christ is present in those who are suffering, the least, last and lost. Our Lady of Pentecost Parish in Katipunan Avenue. 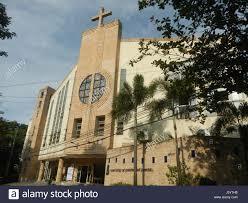 Our Lady of the Pentecost Parish in Salvador St, Varsity Hills, Loyola Heights was our next stop. The exposed Blessed Sacrament was located downstairs, I believe. It was dark and quiet, only the light surrounding the enthroned Holy Eucharist remained bright. Afterwards, we went upstairs to proceed with our next two stations: (7) Jesus falls for the second time, (8) the women of Jerusalem weep over Jesus; As my mom and I reflect on the following stations, we remember the news stories on film, print, radio and TV or even social media that causes unspeakable grief and pain on many people the world over. We should not make light of evil and hatred that is happening right in our midst. We need to see more clearly how dead serious sin can be and how it needs to be atoned for if it is to be overcome. As for the second fall of our Lord Jesus, it is seen how terribly heavy our sins can be as He carries His cross to save us but still He got up and never gave up on us. That’s how much He loves us. In life we fall many times, but He never tires to pick us up for we cannot rise on our own without His grace and mercy. 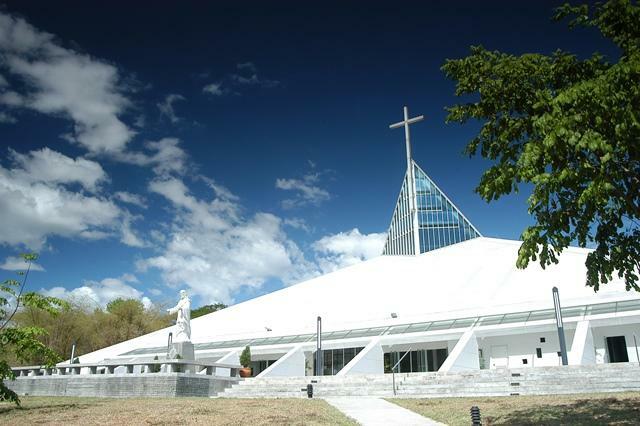 The Church of the Gesù, the Roman Catholic church of the Ateneo de Manila University campus is our next stop. It has brought us warm and fond memories because my sister had her baccalaureate mass before her graduation ceremonies (where she finished her Masters in Business Administration at the Rockwell campus in 2002) at the Henry Lee Irwin Theater. It was extra special because our beloved daddy was still with us then. Eleven years later, we came back for our visita Iglesia sans daddy. 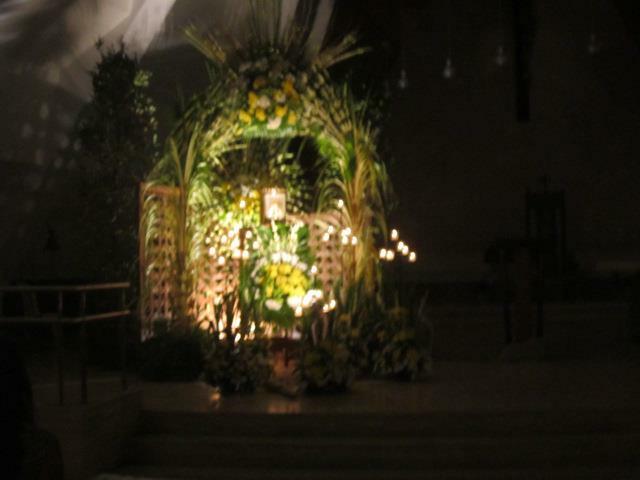 The image of the Blessed Sacrament here was placed in beautiful makeshift bamboo house adorned with yellow button flowers and greens. Like the one at the Our Lady of the Pentecost Parish, it was quite dark inside and there were a few people inside in deep prayer as well. After praying before the exposed Blessed Sacrament, we got up and did the next two stations, (9) Jesus falls for the third time, (10) Jesus is stripped of His garments. In our reflections, we remember Saint John the Evangelist in his First Letter, speaks of a threefold fall: lust of the flesh, lust of the eyes and the pride of life. He interprets the fall of man and the entire humanity against the backdrop of the vices of his own time, with all its excesses and perversions. In today’s world, of how a Christianity which has grown weary of faith has abandoned the Lord: the great dogmas, and the commonplace existence of those who, no longer believing in anything, aimlessly go through life, have built a new level and worse paganism and idolatry, which in its attempt to reject God altogether, have ended up doing away even his own fellowmen. And so there man lies fallen in the dust because of his own doing. Our Lord carries our sins and falls, over and over again, in order to reach out to us. He lovingly looks upon us, He touches our hearts; and yes, He falls in order to raise us up so we too could rise with Him. In the next station, our Lord is stripped off His Divinity in order to embrace our sinful humanity. Clothing gives a man his place in society, it makes him someone who is looked up to, someone very important. His public stripping means that Jesus is simply nothing but an outcast, hated by everyone. The moment of the stripping reminds us of the expulsion of our first parents Adam and Eve from Paradise: God’s splendor has fallen away from mankind, who now stands naked and exposed, unclad and ashamed. And so Jesus once again takes on the condition of fallen and sinful man. Stripped of his garments, He reminds us that we have all lost the “first garment” that is God’s glory. At the foot of the Cross, the soldiers casted lots to divide His clothes. Let us not forget that John 19:23 says that lots were drawn for Jesus’s tunic, “woven without seam from top to bottom” (Jn 19:23). We may consider this as a reference to the High Priest’s robe, which was “woven from a single thread”, without stitching (Fl. Josephus, a III, 161). For He, the Holy and Crucified One, is the only true High Priest. This is how our Lord brought meaning into seeming meaninglessness. This is how He makes us realize that His Heavenly Father holds Him, us, and the entire world in His hands. Let us give a profound respect and uphold the dignity for man at every stage of his life, and in all the situations in which we encounter our Lord. Let us ask Him to clothe us in the light of His grace. 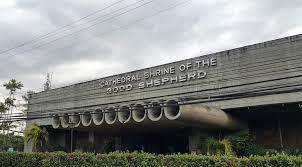 Next up for us is the Santa Maria Dela Strada Parish in Katipunan Avenue corner Pansol Avenue, in Diliman. 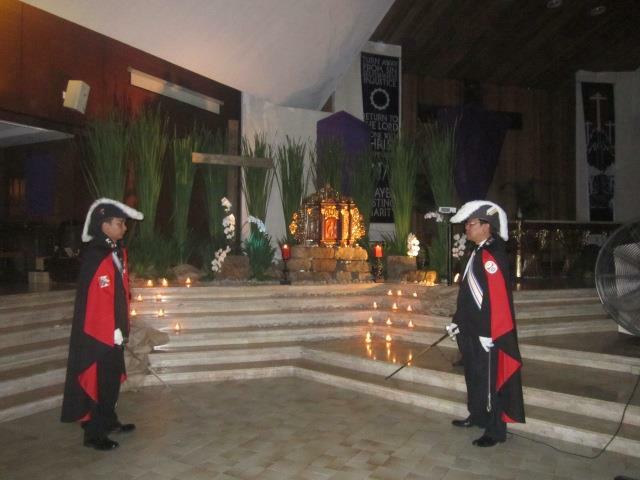 Here the exposed Blessed Sacrament is placed inside the church guarded by two members of the Knight of Columbus (KOC) clad in their red, black and white uniforms holding one sword each. My mom and I slowly went up to the Blessed Sacrament with two huge pink candles on the left and right respectively where every step was filled with small votive candles. After our prayers we went to the Santa Maria De la Strada Lawn where the Stations of the Cross are placed. They also have a beautiful Grotto there. A mass can also be held here at the lawn. 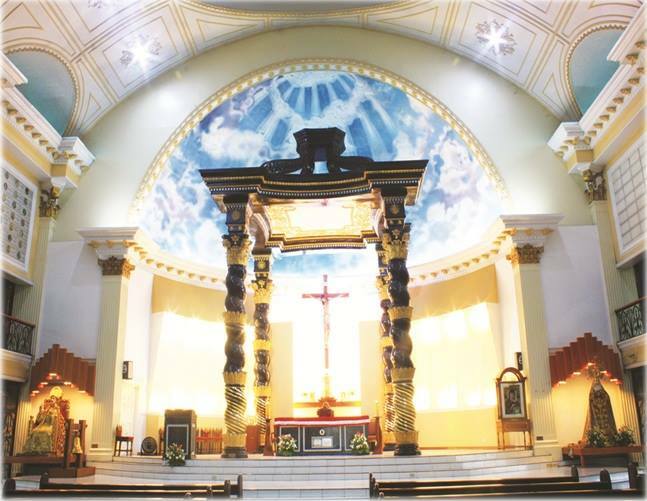 Santa Maria della Stada Parish along Katipunan Avenue. As we reflected on the next two stations, (11) Jesus is nailed to the cross, (12) Jesus dies on the cross, it has come to mind that let us stop before this painful image of the suffering Son of God. Let us look upon Him at times of presumptuousness and pleasure, in order to learn to respect limits and to see the shallowness of all material goods. Let us look upon Him in times of trial, heartbreak and tribulation, and realize that it is then that we are closest to God. Let us try to see His face in the people we might hurt or look down upon. As we stand before the condemned Savior, who did not use His power to come down from the Cross, but endured its suffering up to the end! Let us nail ourselves to Him, resisting the temptation to stand apart, or to join others in mocking Him. By accepting the terrible cruelty of this suffering, the destruction of His Sacred body and dignity, He let Himself to be nailed fast; He hardly try to escape or to lessen His suffering. May we never flee from what we are called to do. Let us pray to Him for the grace to remain faithful to Him. May He help us to unmask the false freedom which would separate us from Him. May we accept His “binding” freedom, and, let us be “bound” fast to Him, to discover real freedom. On the 12th station, it has come to our understanding that the Lord Jesus has triumphed from the Cross. His words were clear: “Courage! I have overcome the world!” He died accomplishing His mission to redeem us from sin and death. He manifested Himself on the Cross through His light shining in our world darkened by evil and indifference. In the world we live in this is defeat but in the eyes of God, it is sweet success, sweet revenge from Him no less through His Son. The kingship of Jesus was proclaimed before the world. Jesus is indeed the King of the world! Now he is truly “lifted up”. In descending to the depths he rose to the topmost pinnacle. Now He has completely brought to fruition the commandment of love, He has satisfied the offering of Himself, and in this way He is now the expectation of the true image of God, the God who alone is love. Now we finally know who God is! Now we know what true kingship is all about. 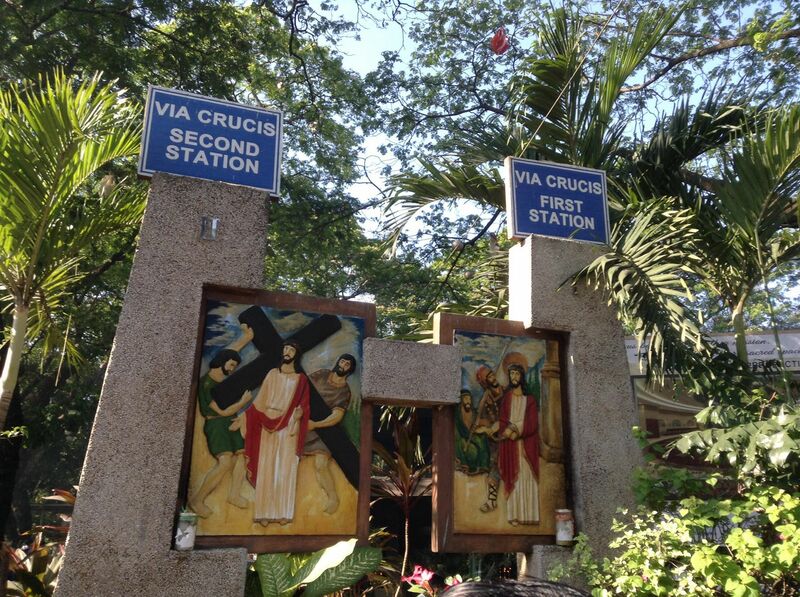 And our final stop before heading back home is at the St Peter’s Parish in Commonwealth Quezon City. 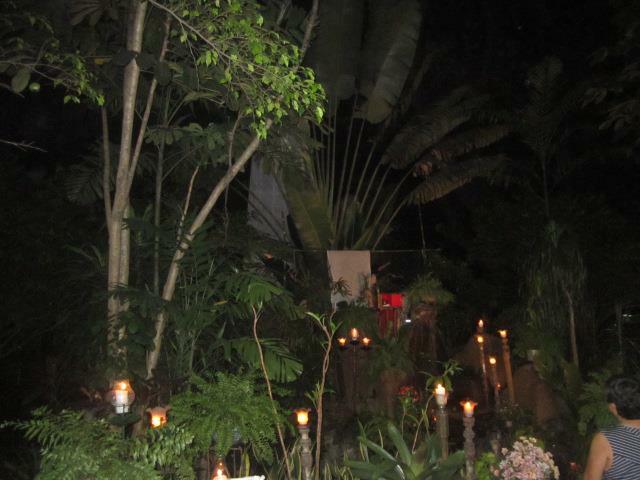 When we arrived, only a handful of people were there; the place where the exposed Blessed Sacrament was supposed to be there was already vacant outside although it was draped in white surrounded with green foliage and a spray of white orchids on top of it. Unfortunately, the exposed Blessed Sacrament was already put back inside and the church was already closed. But that did not hinder us from praying and reflecting on the last two stations (13) Jesus is taken down from the cross, and (14) Jesus is placed in the sepulcher. Jesus is now dead. From His heart, pierced by the lance of the Roman soldier Longinus, flow blood and water: truly a mysterious image of the stream of the sacraments, Baptism and the Eucharist, by which the Church is constantly reborn from the opened heart of the Lord. Jesus’ legs are not broken, like those of the two men crucified with him. He is thus revealed as the true Paschal lamb, not one of whose bones never broken In this hour of immense grief, of darkness and despair, the light of hope is ever present. The hidden God continues to be the God of life, ever so near. Even in the night of death, the Lord continues to be our Lord and Saviour. He descended into the darkness of death. But His body is wrapped in a white shroud (Mt 27:59). Faith has not entirely died; the sun has not totally set. In the hour of darkness, He is still there-let us not forget that. He does not abandon us when we are tempted to lose hope. May He help us not to leave Him alone. May He give us the fidelity to sustain moments of confusion and ready to embrace Him in our utter helplessness, like our Blessed Mother, who one more time holds Him close to her chest. May He help us all, the poor and rich, simple and learned, to look beyond our fears, differences and prejudices, and to offer Him our abilities, our hearts and our time, and thus to be witnesses of His resurrection . 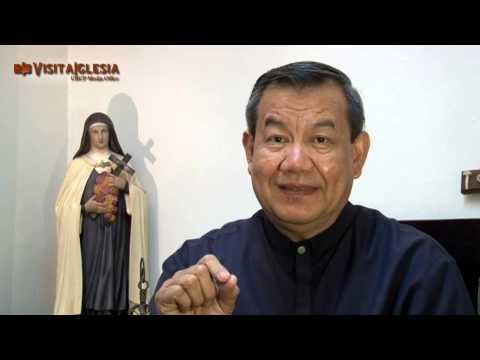 In that one visita Iglesia experience , my mom and I learned so much that we share all these not only with my sister but also with FilCatholic readers, as well. May this Holy Week give us the grace to practice humility, obedience, patience, selflessness and justice and onwards.